TNR -- TV News and Reviews: Say Yes to the Dress -- "Family Dynamics"
Tonight on Say Yes to the Dress, the focus is on three different "Family Dynamics". First up we have Julie, who brings her opinionated and abrasive mother and sister to help her find a dress. I was ready to have sympathy for Julie, whose mother thought she should buy a dress on eBay for $100. Julie told Kleinfeld consultant Dianne that she wanted to spend $5-6000. Her mother said, "Well, you'd better save your pennies." Julie replied, "That's what you and dad are for." After that, I didn't have much sympathy for her. If it's your own money, you can spend however much you want. If it's your parents, then you have to respect their budget. On top of it, Julie was looking at completely plain dresses with absolutely no embellishment, and settled on one for $5600. Her mother was aghast at the price, and Julie couldn't say for sure that it was *the* dress, so they left without anything. Perhaps if Julie had started at a more moderate rice point, her mother wouldn't have been as hostile, and she might have gotten a dress. Next up were Beth and Joy, a lesbian couple planning their upcoming wedding. I was ready to say that it was silly that they came to a big bridal dress store looking for white pantsuits, but I think it was a set-up by the show. The consultant just "happened" to remember that they had a trunk show going on, with Amy Michaelson, who "happens" to design palazzo pantsuits. Despite the corny set-up, it was a sweet part of the "Family Dynamics" episode. While Beth was working with Sarah and designer Amy on a coffee-colored pantsuit design, Debbie and Randy convinced Joy to try on a dress. A ball gown design, it wasn't too poufy and was very figure-flattering. Joy looked a little stunned at being caught in a dress, but when she stepped out of the dressing room, Beth's eyes lit up at the sight of her. It took awhile for Joy to adjust to the idea of wearing a wedding gown for the whole day, but each time she looked at Beth's smiling face, she caved in a little more. Finally she decided to Say Yes to the Dress, and the happy couple went away even happier. The third and final bride was Anna Lee, whose parents had adopted her as a baby after they'd already had four boys of their own. Anna was very close with her mother, and was happy to bring her to Kleinfeld's to find a gown for her destination wedding in the Caribbean. Anna was looking for a simple sheath dress in chiffon, for around $1000. Keasha told her she had expensive taste, and it might be tricky to find something in that price range. She found Anna a beautiful lace sheath that was light and airy, with spaghetti straps and a delicate ribbon tie across the low-cut back. It was love at first sight, and after trying on a number of other dresses, Anna returned to the first lace dress that turned out to be $4000. So much for a budget! The moral of the story is that if you have a modest budget, don't go to Kleinfeld's. Either the consultant will find you a budget-buster, or you'll see one on the rack that you want to try on. Once you see a pricier dress, you'll probably want it. If you never know these dresses exist, you won't be tempted. Watch all the budgets fly out the window on TLCs Say Yes to the Dress, Friday nights at 10/9c. 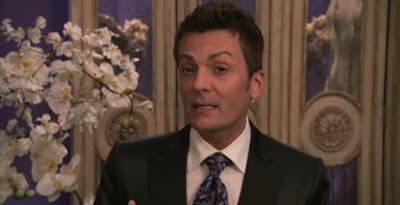 PHOTO: Fashion director Randy from Kleinfeld's, Say Yes to the Dress screencap c2009 TLC. Do you know the name of the designer of the dress that anna lee bought?